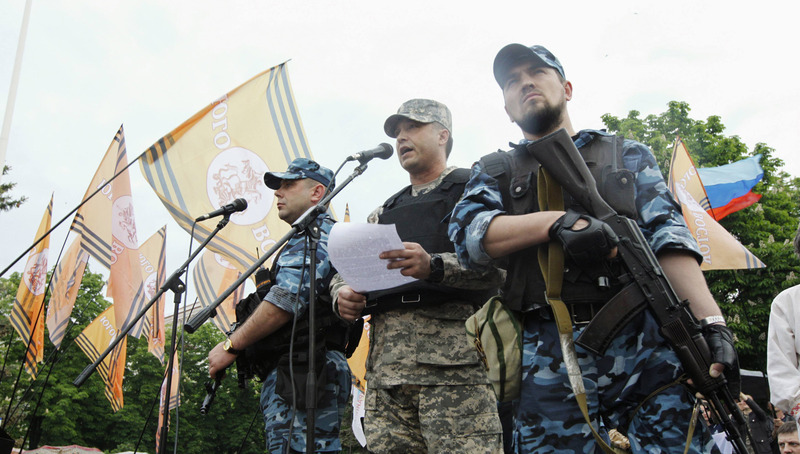 JNN 23 May 2014 Kiev : The leadership of the self-proclaimed “Lugansk People’s Republic” in eastern Ukraine declared martial law Thursday and asked Russia to send troops to “protect civilians”. “I order the imposition of martial law and declare full mobilization on the territory of the Lugansk Republic,” Valery Bolotov, the self-styled head of the republic, said in a statement. Earlier in the day, Bolotov released a video addressed to Russia’s leadership asking for “peacekeeping troops” in a bid to “resist aggression against civilians”. “Ukrainian troops have committed an act of aggression against civilians, the illegitimate Kiev government is carrying out a punitive operation against Lugansk republic,” Bolotov said in his address. He said the militia was not equipped to resist Ukrainian troops by itself. Russian forces, which have been holding military exercises near Ukraine’s border, began returning to their bases Wednesday, according to the Russian Defense Ministry. Armed activists in Lugansk and its neighboring Donetsk regions established “people’s republics” in early April and held referenda on their future status on May 11. Organizers of the referenda later announced the overwhelming majority of voters favored independence. At least 13 Ukrainian soldiers have been killed in a rebel attack at a Ukrainian military checkpoint in the eastern Donetsk region early Thursday, the country’s acting President Alexandr Turchynov said. “Our troops defended the town of Volnovakha and have not allowed insurgents to break through defenses, but unfortunately, our soldiers sacrificed their lives for Ukraine, tolerating mortar fire and heavy weapon fire,” Turchynov said during his meeting with local religious figures. Earlier in the day, the country’s Defense Ministry had said heavy casualties were expected after insurgents attacked the checkpoint with rocket-propelled grenades and mortars, causing a Ukrainian armored vehicle to ignite and triggering a massive explosion. There has been no official word on rebel casualties, but local media cited sources in the separatist camp as saying 25 insurgents were injured. The incident comes just three days before the presidential election in Ukraine scheduled for May 25, triggering fears of possible disruption of the vote in the eastern part of the country. According to the Central Election Committee, as of Thursday afternoon, 18 of 34 regional election commissions in Lugansk and Donetsk regions were blocked by separatists, who seek independence from the central government in Kiev. This entry was posted in Jafria and tagged eastern Ukraine, Lugansk, Lugansk People's Republic, Lugansk Republic, Russia, Valery Bolotov. Bookmark the permalink.